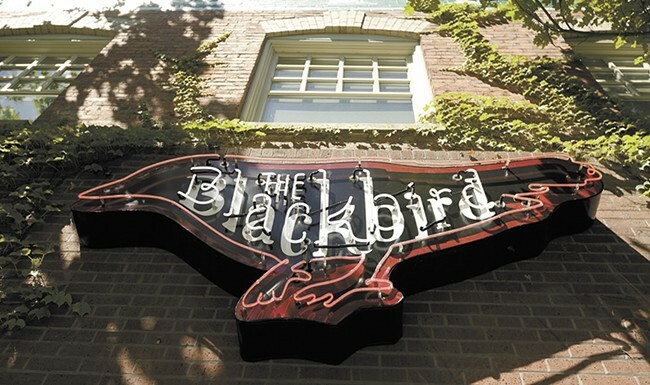 The Blackbird Tavern & Kitchen's "happier hour" runs Mon-Fri and Sunday. The beers on tap available for happier hour are highlighted in red. he time of day when drinks and bar snacks are well priced is referred to as happier hour. And truly, if one arrives right after work at 5:15 pm, happiness will ensue. Saddled up at the sleek wooden bar, a friend and I discussed all of the current world problems — Trump, terrorist attacks and why more people should probably like hockey — and almost had them pretty well solved, had we not had to go home that evening. Through the talking, we sampled a selection of snacks and beverages. As far as Blackbird’s HH signature cocktails go, they are a fascinating experience. With the purple-ish elderberry Bessie gin martini, the grapefruit juice and lavender simple syrup combine to leave a slight sour and potent taste. The yellow-hued humidor martini, on the other hand, tastes like licking an actual tree, thanks to the cedar gin used in its creation. Helping us swallow these creative beverages was the bacon fat popcorn, which comes with brown sugar and sea salt sprinkled on top, and the pork five spice bao (a steamed bun). Both were divine. Popcorn is one of my favorites anyway, but with that salty and sweet combination here, Blackbird’s take could be the best in town. Other options on the bar snack list included a variety of housemade pickles, smoked cashews and cherries and a helping of pimento cheese with cayenne maple potato chips. It’s clear that chef Molly Patrick doesn’t want to do put anything ordinary on the menu. With just a little time left before the 6 pm happier hour cutoff, we ordered some beers. 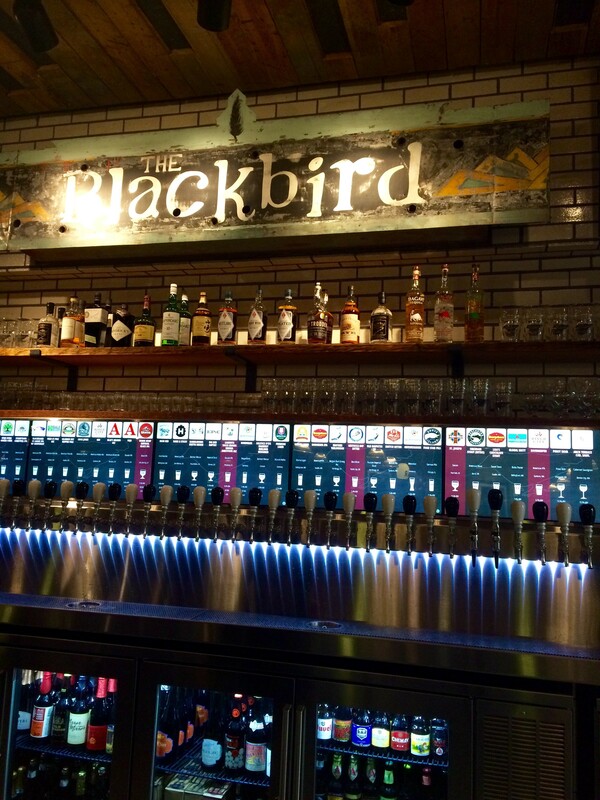 Just like the restaurant’s sister, Manito Tap House on the South Hill, Blackbird outdoes itself on the beer selection with 34 on tap. With five HH selections to choose from, I went for the Selkirk Abbey St. Joseph saison (all the others were essentially IPAs, and I’m pretty much the only person in the PNW who isn’t all about the hops). Fruity and robust with an 9.3 percent ABV, it was a good thing our helpful bartender also plied us with ice waters. Recently named the Best New Restaurant in the Inlander’s Best Of poll, Blackbird, the spot in the former Broadview Dairy building manages to feel open yet still inviting. People are often dressed in workplace attire, but jeans are more than welcome. The tap beer and wine selections seem to be the most popular with those coming in for a HH deal. And who could blame them? Happier hour runs Mon-Fri from 3 pm-6 pm, and from 3 pm-close on Sunday. Draft beer is 50 percent off (a rotating list of at least five select beers ranging from $5-$10) and select cocktails are $5. Also featured are $5 glasses of wine (rotating). Bar snacks run at $3. Happier hour is only served at the bar. To learn more about Happy Hours around the Inland Northwest, visit Inlander.com on your phone and download our Drinkspotter app, or simply visit this page.